I thought I would share some favorite cottage details with you. These are things that I think make up a charming cottage. First, is the exterior. A cottage means "small house" with lots of country charm (to me). I think this one fits the bill nicely. Inside, it would have to have a cozy fireplace to snuggle up to and slip covered comfortable seating. 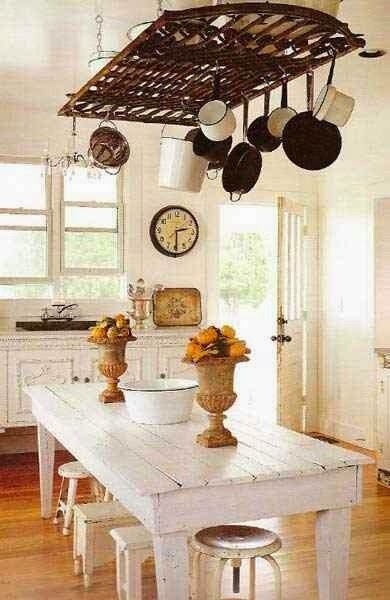 The kitchen would have to be very casual and homey. Full of country touches and lots of sunlight. 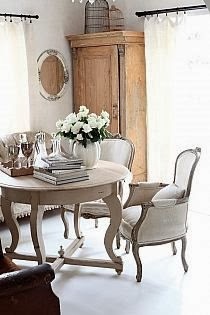 The dining area would be intimate and slightly feminine. The master bedroom would feel spacious and serene, yet cozy at the same time. And the backyard would feel like a private oasis. These are just some of the details I would look for in my cottage. That is really the approach I take to living in my own house. I decorate by the "feel" I want the rooms to have. I think decorating is more than just matching fabrics and selecting furniture. It's about creating personality. I'm not talking about adding whimsical things either. Just that there is a presence about your home that is felt from the moment you enter. Do you know what I mean? I think that's what keeps rooms from looking like they belong in a furniture showroom. That's why we gravitate towards magazines. We're looking for the right "feel" of a room. We are all drawn to different types too. Do you have a certain "feel" that you gravitate towards? I love the cottage look and these pictures hit the nail on the head. I would love to have a back yard like that! I feel the same way you do. Love the look of the cottage you posted. I was just looking at Hooked on Houses and the feature was the home of one of the Kardashians. To me, it was "over the top" UGLY. Then I looked at the sweet photos of rooms you liked. They are so comfy, welcoming and comfortable. I live in a cottage after downsizing from a big house. I am drawn to cozy, warm and friendly decor. I really like all the pics (very inspiring), I think you described the cottage I've been dreaming of :) Unfortunately, we haven't got so much space and many rooms, but still, I will try to make my own place as charming as possible. Love all these pics and oh how I would love a fireplace in the bedroom! I love cozy rooms too. One thing I always like to do is have things scattered around the house that we've picked up while on vacation. I'm always looking for little home decor items when we visit other places. For me, it not only brings back good memories from the vacation, but also adds interest to the room. Such a lovely post, Kelly. You're onto something with this! I like the cottage feel, which is natural for where we live and how we live. It's all about scale and comfort - when you have those two things everything else falls into place. I agree with what you like in a home. I love a cozy home with cottage and farmhouse accents. No stuffy matchy modern stuff for me. I like it all mixed up. COZY is the word. Oh Kelly what a dream cottage home that would be with all your lovely inspiration photos. I would love that as a home. I agree your rooms need to reflect you and comfort. Love that fireplace in the master bedroom how charming is that?!!!! If you count the color red, I guess I do! I want to live in that photo of the outdoors. You could be in that spot and not see a person for miles around. Just think of the birds I could photograph! Kelly, you are so on target with the personality of a home. Whether you are fortunate to have a cottage or a large home. Before we retired we lived in a large old parsonage. Seen bare no one would have wanted to live in it, but (not bragging) I have each room a personality, and over and over again, people would comment about how cozy and country it looked...It welcomed many friends and church people. Fast forward...we retired 6 years ago and have a very small house ~ I've tried to make it our cottage, and have been successful to my satisfaction. 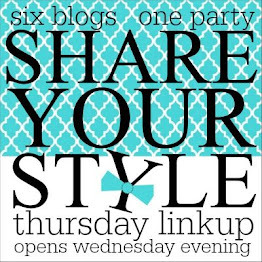 You are a great inspiration...and I've done several things since meeting you on the blog. My hero! Hey Kelly…I know your sister Kim - I consider us blog friends. I did not know she had a sister named Kelly. My name is Kelly! I author the blog www.mysoulfulhome.com I found you through a Canadian blog, the author whom commented on my blog, then I visited & saw your cottage post on her sidebar. I found you by falling through the rabbit hole of blogs! Love all things cottage! Pinning your picsI Great blog! I'm definitely drawn to those cottage photos! Someday, I think I'd like to own one. I totally agree that rooms should have a feel to them... a heart, a soul. It's what makes home...home. Yes, love the first one! It's exactly what I have in mine for my dream house-really! And the bedroom , oh my! Beautiful pictures. I love, love cottage style. Gorgeous photos, Kelly! 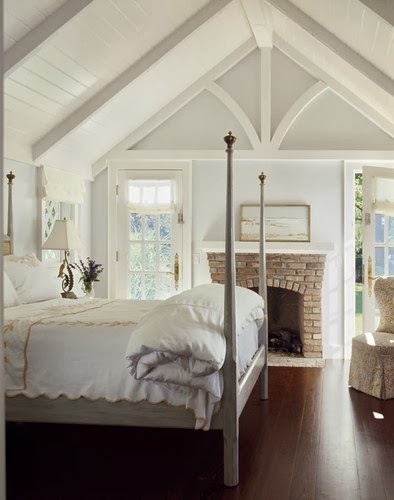 That bedroom with the fireplace and vaulted wood ceiling is heavenly! I am so ready for the cottage!!! Love it Kelly!! Now you've got me thinking! 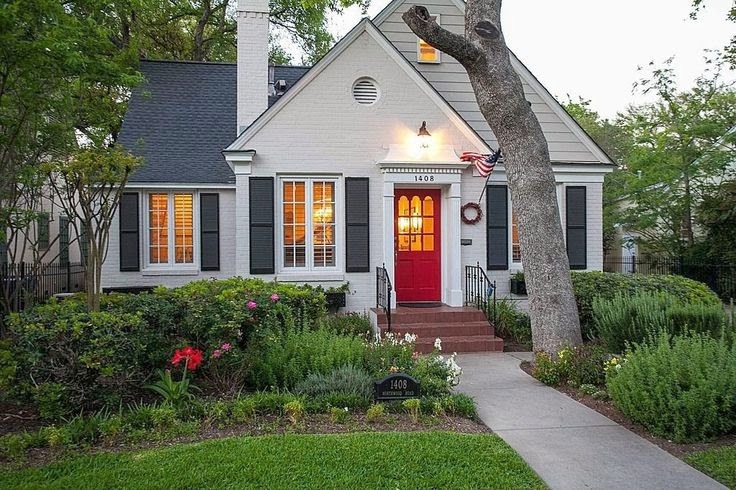 I like all your photos, but would add a big front porch! 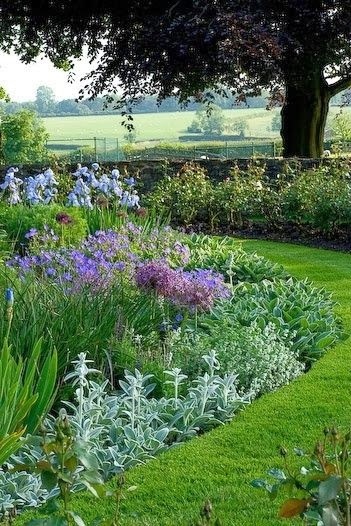 I'm ready to move into any one of those pictures, but none more so than the garden. How lovely! I'm sooooo ready for my little cottage. I wonder if it will ever happen? You do a beautiful job of creating a cozy, warm and inviting feel in your rooms, Kelly! I love these pictutres, would love to have a firplace in the bedroom! LOVE that potrack, I wonder if it is metal or wood? So pretty!! !